Take your movies, favorite music, DVDs, and YouTube videos with you. Mobile Media Player is a multi-purpose video and audio player for your phone. 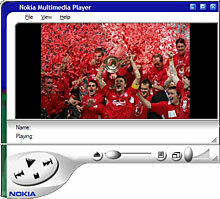 Nokia 3gp player is very famous and favorite player and well known to everyone. Mobile Media Player consists of two software components: Media player application that resides on the phone, finds and plays video files from the phone's file system or memory card. Video converter utility that allows user to convert user's video files into format and frame size suitable for playback on the phone by Mobiola Media Player and to transfer these files to the phone. Just run your Nokia PC Suite and Mobile Video Converter, connect your phone to PC, select desired quality and upload any file into your device using Mobile Video Converter by simply dragging and dropping your files or DVD disk into the application window. That's all! No additional video settings of converter are required.The Nokia Multimedia Player can convert many modern multimedia formats (AVI, MPEG, MP3, QuickTime, WAV) to 3GP and AMR files that can be played on a mobile phone. You can also use the freeware as a media player. The process of converting files is relatively simple, open the file in the Multimedia Player and select File | Save As. The program makes all the other settings itself which can sometimes lead to loss of quality, but this is also affected by the considerable compression that is required to reduce the files to a size that can sensibly be put onto a mobile phone. To convert QuickTime files, you will need to have the QuickTime Player installed on your PC. The software is suitable for use with mobiles with 3GP and AMR support. Support for playing 3GP and 3GP2 files. Adjust volume and other options as per your demand.